Housing in New York City can be expensive, particularly in the summer. Summer Scholars will be housed in a local university dormitory or hotel, or are welcome to make their own arrangements. Rates will be approximately $75-$95 a night. More detailed information will be posted shortly. American Women in the Revolutionary and Civil Wars will harness the power of New-York Historical’s collections, exhibitions, installations, education materials, and vibrant community of scholars to provide Summer Scholars with a rigorous and focused training ground for expanded content and pedagogical knowledge. Founded in 1804 as one of the country’s first collections-based educational institutions, N-YHS is New York's oldest museum and a nationally-renowned research library. As such, it became the natural home for priceless objects, images, works of art, documents, manuscripts, and more pertaining to the American Revolution and Civil War eras in particular. 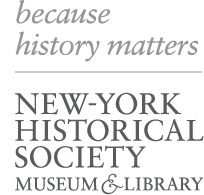 NEH Summer Scholars will have VIP access to the New-York Historical Society’s research library and museum collections. During the Institute, the library will be open for research Tuesday-Saturday, 10:00-4:45. Additionally, the library and the museum have a wealth of digitized collections that can be accessed online from any location. Participants are strongly encouraged to bring their own laptops. The library has a limited number of public computers Summer Scholars can take advantage of during library hours. A small number of laptops may be available for check out by Summer Scholars. Participants will have access to the institute classroom from 8:30-5:00 each day, which includes free wifi and printing. Participants will receive copies of all books on the reading list, a course pack of primary sources recommended by the faculty, and relevant curriculum materials from past New-York Historical Society exhibitions. At the conclusion of the Institute, participants who attend all sessions and complete all assignments will receive a certificate of completion along with a detailed letter outlining the syllabus and participants’ responsibilities, which may assist in pursuing continuing education credits in your home district or state.